For aperture photometry, a common operation is to compute, for a given image and region, a mask or array of pixel indices defining which pixels (in the whole image or a minimal rectangular bounding box) are inside and outside the region. mode='exact': the overlap is determined using the exact geometrical overlap between pixels and the region. This is slower than using the central position, but allows partial overlap to be treated correctly. 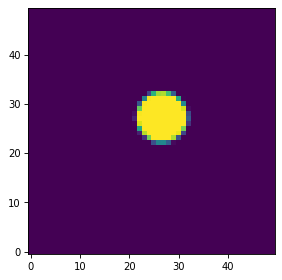 mode='subpixels': the overlap is determined by sub-sampling the pixel using a grid of sub-pixels. The number of sub-pixels to use in this mode should be given using the subpixels argument. As we’ve seen above, the Mask objects have a data attribute that contains a Numpy array with the mask values. 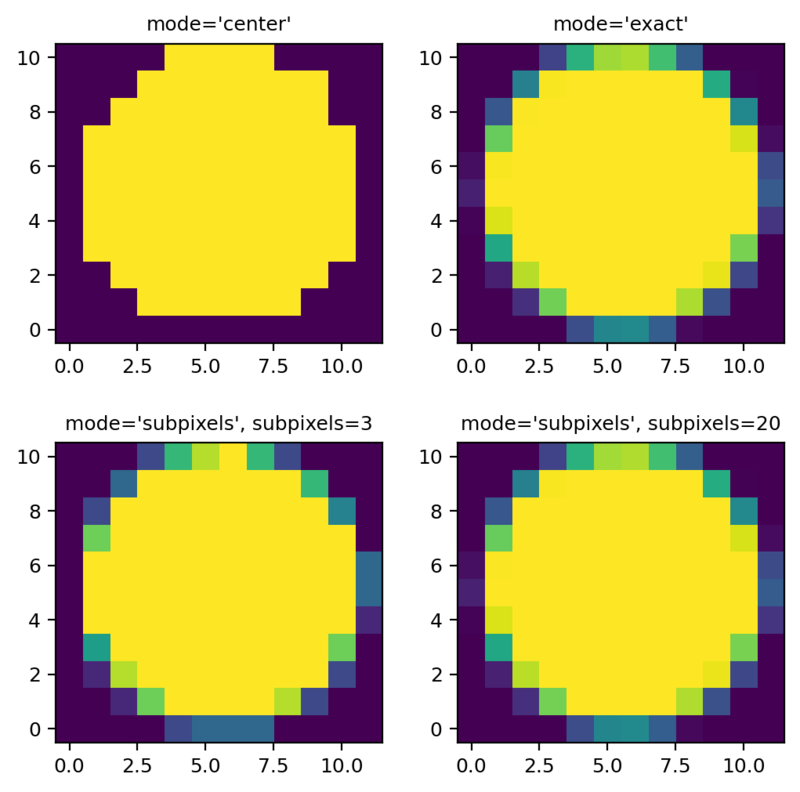 However, if you have for example a circular region with a radius of 3 pixels at a pixel position of (1000, 1000), it would be inefficient to store a mask that has a size larger than this, so instead we store the mask using the minimal array that contains the mask, and the Mask objects also include a bbox attribute that is a BoundingBox object used to indicate where the mask should be applied in an image. The cutout() method can be used to create a cutout from the input data over the mask bounding box, and the multiply() method can be used to multiply the aperture mask with the input data to create a mask-weighted data cutout. All of these methods properly handle the cases of partial or no overlap of the aperture mask with the data.